The IV Center of NYC spearheaded, by our best in class triple board certified doctor, offers an unparalleled variety of IV therapy infusion drips that help treat most ailments. We offer IV vitamin, supplement, mineral, and fluids for muscle fatigue, hangovers, cold and flu, sports recover, pre-natal, general health and wellness, stress, anxiety, and more. 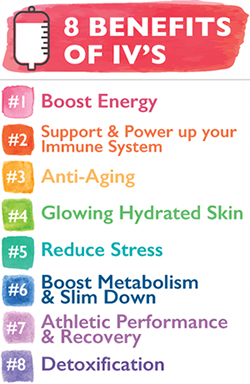 IV vitamin therapy can improve your general health and overall well-being. In short, IV therapy is the fastest, most efficient delivery method to distribute vital fluids & nutrients throughout your body. What is actually in the IV infusion bag? Vitamins, nutrients, minerals and fluids. These are not the same kind you take daily because ours are medical grade. What exactly is V therapy? Intravenous (or IV) Therapy involves the insertion of a small cannula into a vein in your arm. The treatment is painless and remarkable effective. Nutrients are delivered into your bloodstream via a drip, bypassing your digestive system and drastically improving the absorption rate of the vitamin, minerals, of specialized “cocktail” infusions you are receiving. How long does IV therapy take? Typically IV infusion takes about 40 minutes to administer. Is IV therapy safe? Yes – IV therapy is a safe and simple procedure. IV therapy patients also tend to experience minimal — if any — side effects. What conditions can IV therapy treat? IV therapy can be effective in treating and supplementing treatment for a number of conditions. Some of the most commonly treated conditions include fatigue, cold, flu, intestinal malabsorption, wound healing, allergies, skin conditions, weight loss, muscle spasms, fibromyalgia, fatigue, skin and respiratory allergies, coronary disease, migraines, depression, headaches, acne, narcotic withdrawals, hyperthyroidism, malabsorption syndromes, post gastric by pass patients, post op patients, and much more. IV therapy can also be used for a number of other purposes such as enhancing athletic performance and supplementing cancer treatments such as chemotherapy. How long until I actually feel the effects of my IV therapy treatment? Many patients actually begin feeling the effects of their IV therapy treatment while the IV infusion is being administered. The effects can be immediate or take a few days to feel the full effect. With intravenous vitamin, supplement, and / or mineral therapy the nutrients enter your bloodstream directly and immediately to help the body to begin healing itself. You get much higher concentrations of nutrients delivered directly to your body’s cells through intravenous therapy, thus allowing your body to better absorb and utilize these nutrients to fight off whatever ailment has brought you to The IV Therapy Center of NYC. Where do you get your ingredients? The IV Therapy Center of NYC source our ingredients and supplies from a variety of the most reputable United States medical suppliers. We pride ourselves on using only the best, most effective, and safest infusion ingredients in the industry. How often can I get an IV therapy treatment? Many our clients use our services weekly. However, you should tailor your IV treatments based on your bodies demand. Our medical staff will assist you with tailoring your infusions to get the maximum benefit based on your unique need such as preparing for a marathon, sports recovery, pre-natal needs, weight loss needs, etc. What is the difference between IV Vitamin Therapy and taking oral vitamins? Only 5% of the oral vitamins are absorbed when taken by mouth. Not only the absorption is very low because of the acids in our stomach, but also the high doses of vitamin can cause irritation and sensitivity. Even when we increase the doses given orally, there is a threshold that is dictated by the absorption capacity of the stomach.